Since there seems to be widespread misunderstanding regarding the heresy of Nestorianism and what Nestorius actually taught, I’ve decided to post some notes illustrating and explicating Nestorius’ teaching. I have used McGuckin’s, Saint Cyril of Alexandria and the Christological Controversy. I’ve numbered selections for ease of reference. There are a number of things to notice in the notes. Notice the problem of mixture. This was a significant issue all by itself in antiquity since for Platonists as well as Aristotle, matter was not intrinsically extensional as the modern conception has it. A mixture was a meeting of powers. Notice also that Nestorius takes the will to be almost exclusively hypostatic rather than natural so that there is only one will in “Christ.” Terms like “Christ” also do not refer to the eternal Logos exclusively but the end result of the union. There is also an apparent confusion between person and nature as manifested in Nestorius’ language concerning the eternal hypostasis of the Logos,where hypostasis seems to do double duty to refer to the divine essence as well as the divine person. A person then seems to be an instance of a kind. It is entirely unclear where or what the divine person of the Logos is. Also notice the extrinsic relation he posits between the two instantated essences or “hypostases” where one uses the other in an instrumental way such that the union transcends nature and is one of “grace.” Christ was then the chief moral examplar. It isn’t hard to see why the Pelagians cuddled up to the Nestorians. On the other end, the instruemtnalization of Christ’s humanity with the union as one of “grace” as superior to nature maps onto Augustine’s Christology. Some overlap into semiotics is also important as well as the preceding history of medical science in the notion of prosopon as a “sign” of a nature or a somewhat metaphysically thined out energy. 1. “To be fully human, on the other hand, demands that one must be ready to attribute to Christ the fully panoply of human characteristics, excepting sin which is not a ‘humanising’ characteristic or even a defining human attribute in any case. He must have a human mind, a human soul with human feelings choices and limitations, both mental and physical, involving him in a range of testing situations (the temptations of the Lord) which proved and refined his virtue as a man, and which involved him inexorably in all the suffering consequent on being human. Nestorius was unswerving on the point that this demanded that the approach of Apollinaris represented a dead-end…here it will suffice to remark that Apollinaris had found no place for a human limited consciousness in Christ, or for a human soul which could be considered as the seat of genuine human choices. Apollinaris’ logic demanded that these things must be sacrificed in the interests of the unity of the person of Christ, if one were to accept the infinite mind of the Logos inhabited his human frame. Nestorius took the earlier Christological heresy of Docetism as an extreme form of the same tendency in Apollinaris to acknowledge merely the appearance of fleshly limitations in the divine Christ who was really unlimited. 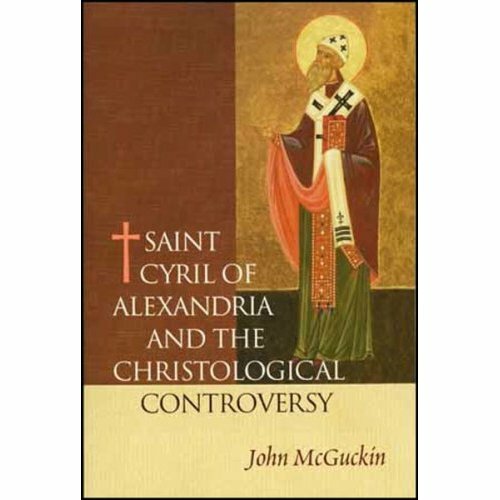 John Anthony McGuckin, St. Cyril of Alexandria and the Christological Controversy, SVS, 2004, 130-131. Ousia: Essence, substance, being, genus, or nature. Prosopon: The observable character, defining properties, manifestation of a reality. Nestorius, (Loofs, Nestoriana. Halle 1905) 269. Nestorius, The Book of Heraclides, 102. Nestorius, The Book of Heraclides, 230. (c) a union by God’s goo favor/grace (kat eudokian). Nestorius, The Book of Heraclides, 305. Thank you for the clarification on “mixture”! Although still an “academician,” I think academics fails unless grounded in prayer and fasting. Perhaps I shall even be shot through with divine light some day. I cannot claim such for myself, though. Miracles? Yes. Directly from God? Of course. But witnessing such is not the same of what you speak. Your are quite kind, yourself, and clearly farther along the Way than I. Please keep me in your prayers. On blameless passions, no need to thank me. Thank St. Maximos the Confessor and other fathers who spoke thus. I was an Academician [it seems like a 1,000 Centuries ago]- although after I was shot through with LIGHT! and rearranged at a sub-molecular level [or sub-cellular level]- I found like Symeon the new Theologian that it had triggered radical Cognitive and Pneumatological alterations and I sometimes switch into being a HOLY Fool – so I do ask your forgiveness and thank you for your Grace. From what I have seen of you – you are an extraordinary and creaive man with real momentum in the Spirit and a Heart for Building the Church. I like your treatment of Dispassion and I really like your caegory of “Blameless Passions”. Mixture. No. I am not keen on mixtures, I chose “Interfusion” because I wanted to capture a form of dialectical dynamic tension and kenotic exchange between the Divine and the Human aspects of Jesus in terms Trinitarian Intentionality, Soteriology and Eschatological Purpose. Thank you for leveling with me. Don’t worry about needing to be forgiven. No offense was caused. I just didn’t want to go that route. You’re correct you didn’t say “jettison.” My assumption. Sorry about that. The way I’d handle Eph 4:30 and many other such texts is probably what you’d also expect from an Orthodox priest. On most issues, I’m quite predictable to those who know their Church history 😀 Of course, there are exceptions. This is not one. Here, I would fall back on apophatic theology, noting the limitedness of our language. Also, I would ask us to keep in mind that not all passions are inherently sinful and therefore less than divine. So, there may be something akin to what we call “grief,” but in a way that we cannot fully comprehend, such that we use the word but do not think the use of the word means God himself is sinfully suffering or less than God. We do this with love, do we not? God loves, and we say this, even saying “God is love” and Christ takes on blameless passions and truly has them and weeps over Lazarus, but we do not think God himself is subject to suffering in a manner that makes him subject to something outside himself. Concerning enhypostatic inter-fusion, “enhypostasis” has a history in Christological debates and I’m aware of its usage. The “inter-fusion” is something I’ve not encountered before. I take it you mean something along the lines of “mixture” in light of the debate above with Perry. Would I be understanding that correctly? How can the Spirit be grieved if God is Impassible? I am not writing this shedding Crocodile Tears but equally I am not laughing all the way to the Bank as I pass through Ciustoms at the Frontier. I am picking up your interior pneuamtological profile, so I am going to address my comments carefully – I confess I gave you two ‘loaded’ [false]choices and I ask your forgiveness – I was just having some fun and you have been very charitable. My personal view has already been stated in the form of an Enhypostatic Inter-fusion which preserves both the Divinity and Humanity of the LORD Jesus Christ. You must be confusing things, Atlas. Choosing Theotokos does not require that one jettison divine impassibility. All it presumes is the potential for the deification of humanity. It also presumes a singular, personal subject. I was actually hoping you might respond by saying “both Christotokos and Theotokos” but, alas, you appear quite staunchly committed your false dichotomy: no divine properties in humanity or passible divinity. Oh, and there’s no reason to play coy with the question asking and the “I would choose wisely.” Let us just say what we mean and mean what we say. If you choose ‘Christotokos’ then surely you converge with the contention of John Jewel, that though capable of performing supernatural acts, the flesh of Christ possessed no divine properties in reading the “self-emptying” imperative of Kenosis of Philippians 2. However, if your choose Theotokos – then clearly Divine Impassibilty needs to be re-examined in the context of “the Kenosis of His Signature of Divinity” in relation to Philippians 2. And your choice is? I would choose wisely….is that fair? I am sure I read it the way you would expect: The Son of God suffered in the flesh. If God can suffer in his divinity, then he’s not really God. I realize process theology reigns supreme in some circles these days, but it is neither Orthodox nor my position. So, no suffering divinity in Orthodoxy except in the Incarnation, where it the Word’s humanity that suffers, not as a separate person, but as the locus of where the suffering occurs. As for Nestorios, I think you would be in good company to read the earlier and later Nestorios. Sometimes, being exiled to an oasis in the middle of nowhere can give one the time needed to rethink things. To say that “the same One” is “two-fold” is to accept St. Kyril. Read the statement from Chalcedon “one and the same” yet “in two natures.” It’s Cyrilline. You say subtle, I say substantive. Christotokos or Theotokos? 1. His early thought – Dyophysitist: In which he assumes a incarnational reading of Christ, predicated on two loosely-united natures, divine and human. 2. His mature thought in the ‘the Bazaar of Heracleides’, where he makes thee following statement affirming the Incarnation of Christ as “the same one is two-fold” – which is a subtle revision of his earlier Dyophysitism. I want to also look at Cyril of Alexandria in terms of his theology predicated on two states for the Son: the state that existed prior to the Son (or Word/Logos) becoming enfleshed in the person of Jesus and the state that actually became enfleshed in and through the Incarnation – Cyril made the following conjecture: Only the Logos “Incarnate” suffered and died on the Cross and that has implications for how we read Romans 8:3. My contention is that there cannot be a’dislocated engagement’ of the Son in relation to Romans 8:3 and the mature thought of Nestorius is a better statement on the ‘integrated engagement’ of the Son in relation to Romans 8:3. How do you read Romans 8:3 in relation to Incarnational Christology a nd your Sacramental Affirmation of the Chalcedonian Credal statement on the two natures of Christ? I agree that John McGuckin suggests that. I don’t agree that it is the most correct way to speak of Christ to say the Logos bound himself to an already existing “man Jesus.” I simply do not accept such plywood Christology. The humanity is the Word’s own humanity. With regard to the verse in question, I’m not sure what you’re getting at. I don’t see how Romans 8:3 proves Nestorios correct and St. Cyril wrong. Perhaps, you could help me see what you’re getting at. In the spirit of inclusion let me ask you a question? Do you agree with this? Did the Logos “bind” himself to the man Jesus? and would you say this is the correct way to read Romans 8:3 For what the law was powerless to do in that it was weakened by the sinful nature, God did by sending his own Son in the likeness of sinful man to be a sin offering. And so he condemned sin in sinful man? We are Christians and I meant it in Truth. Let me ask you a question in the spirit of teasing out the text. If an act of seeing him, is a simultaneous act of Seeing Him then how can He be hidden? given that ‘Prosporon’ in the cited text is defined as an observable character,defining properties [or ‘attributions’], manifestation of a reality. I don’t believe so . . . at least, it’s not coming to mind. Which book is that? What I meant was that quatheology I take them to be fonts of the race rather than titles given to them or something along those lines. Have you see Wessel’s bk? Oh, and Perry, have you posted on how the idea of “mixture” has changed over the centuries? Guess I haven’t kept up with the debates between you two well enough. If the Old Adam and New Adam are both real persons, and we wish to refer to Ephesians, then how is Nestorios correct, Atlas? There’s no argument in your assertion. In other words, I concur with Perry asking you to explain what you think Ephesians 2:15 means. Perry, I agree with your recommendation. McGuckin’s is very good and helpful. I am not sure if you mean to be sarcastic or not. Care to tease that out a bit? “I don’t take[the]New and Old Adam to be [Metaphysical]Attributions,but Realities”. What a wonderful thing to say. That is really uplifting. As for Nestorius, I simply changed one word to alter the substance of what he was striving to communicate, until he was stopped by the Limits of his Language. I don’t take new and old adam to be attributions, but realities. Moreover, if there is an argument there to make, please make it. As for the person, what is the person in that cited section? The answer to this entire question is in this one verse from 1 Corinthians 15. 1 Corinthians 15:45 So it is written: “The first man Adam became a living being”; the last Adam, a life-giving spirit. If you can understand the attributions of the ‘New Adam’ in comparison to the ‘Old Adam’ then the relationship of the Godhead to our [New] Humanity in and through the Incarnation becomes immediately clear. A Soteriological inter-fusion by mutual engagement. Nestorius, Heraclides, 172. [remixed…in a single word].